Pork. To me, one of God’s most delicious gifts, brimming with good things from the tip of its pert nose to the end of its squiggly tail. Despite the tides all turning to healthier and more sensible eating, I still stubbornly throw myself with wild abandon at all things pork. That being said, there was one cut of pork that I didn’t quite enjoy as much as the others…pork chop. Strange, as I live in a country where almost everyone loves a good pork chop (including my best friend who doesn’t even like pork anywhere near as much as I do!). I, though, find chops, dare I say it, too lean. I prefer getting my pork in the form of a slow cooked belly or hock, a whole roasted lechon, smoky barbecue ribs, or a pata tim in its sweet-sticky sauce. With a pork chop, you’ve got a whole lot of loin and a thinnish strip of fat at the end. It just doesn’t do it for me. – Score the fat side of the cutlet in a cross-hatch pattern. – Mix 2 tablespoons of the soy sauce with 1 tablespoon maple syrup. Pour over the pork cutlet and sprinkle with some freshly cracked black pepper. Leave to marinate, turning every so often, for at least 30 minutes. Make sure to get the marinade into the scored fat side as well. – Mix 1 tablespoon soy sauce with 1 tablespoon maple syrup. Set this aside – this will be the basting sauce. – Pre-heat the oven to 200C/400F. – In a roasting pan or tray toss the onions and apple slices with some olive oil. Season with salt and pepper and place the pan in the oven. – Heat a non-stick skillet on the hob over medium high heat. Add a good glug or two of oil. When the oil is hot add the cutlet. Let this sear in the hot oil for about 3-5 minutes on both sides until golden brown. Hold the cutlet with a pair of tongs and sear its fat side, giving it a nice burnished hue and crisping up the edges. – When your pork culet has achieved a nice sear all around (don’t forget the fat side! ), take the roasting pan out of the oven and lay the cutlet on the onions and apples. Return to the oven and roast for 25-30 minutes, basting with your saved soy-maple mixture every 10 minutes or so, or until done to your liking. – This serves one but is easily scalable to serve more. And speaking of easily attainable, this is a snap to make. The marinade/basting sauce consists of only two ingredients…ok, three counting the pepper. It may seem a bit fiddly to score the fat but believe me it is worth the miniscule bit of effort it will take for you to do it…you will be rewarded with crunchy edges of fat caramelized in a sweet and savory glaze. If you’re really feeling lazy you can forgo the roasted apples but I urge you to give it a try. It goes amazingly with the pork (as apples are wont to do) and just think of it as doing your main dish and sides in one pan! As the pork roasts atop the apples, the maple-soy marinade, along with the juices from the pork, mingle with the softening apples and the slowly caramelizing onions. I know, yum! King Henry is now on our regular grocery rotation, gracing our table once in a while, another cut of pork I have grown to love. Worry not, I do also actually love many healthy things, but pork still remains a steadfast friend, never abandoning me in times of heartache or stress. And I too vow to never abandon my loyal, delicious, and oft misunderstood pig. Even though I am born in the Lunar Year of the Pig, I have no issues AT ALL about revelling in all manner of porcine yumminess 🙂 People don't respect pork fat enough, thanks for being such a steadfast evangelist for it!! 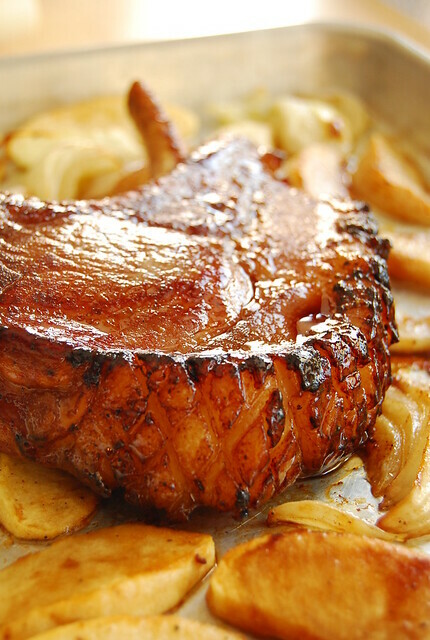 Man, that pork chop looks divine… meal idea!! Thanks as always!! Thanks for sharing. It looks so delicious!! How many people can this 400g King Henry can feed? ooh look at that pork.. it's calling my name. i love the caramelized edges.. it's finger licking good! Hi Ling! Just doing my duty! 🙂 You're very welcome! Hi Peachkins! Thanks! Hope you like it! Oh, would you look at that fabulously glazed richness! Personally, I think pork is the only appropriate meat for the Holidays (and for the rest of the year, come to thing of it, save for Lent…). So crackling and golden and succulent-looking! Looks like a guilty pleasure! =) Would love to try this. looks wicked! must try this soon! thanks, Joey! This is good to know because, like you, I'm a pork lover, but not a pork chop lover. Sounds delicious! Thanks! This looks succulently delicious. Question: Is the King Henry essentially the same as a pork rib roast that has been sliced into chops? My local stores don't have the chops but they do have the roasts and I really want to try this recipe. Thanks! I think this may have been revenge from his 8 wives…served on a platter, with apples and onions….great! Looks so tender. It would be best if served with mashed potatoes. That looks absolutely delicious. I do agree though that the majority of the pork chops you can find here tend to be too lean. And when they are too lean, they come out dry.. But this piece looks just perfect! Hi Roddy! Hahaha! Great way to look at it 😉 This King is definitely in danger from people like us! Hi Kooky Crumb! Haha! Thanks! Hi Junglefrog! So true…which is why I veered away from pork chops for so long. These ones though are awesome! Ohhh! I just made maple pork chops last night! The maple flavor goes nicely with the pork! Hmm..maybe I'll add apples next time! I agree that pork chop is too "lean" for a pig dish. So I'm very excited to try this recipe of yours. Thanks! Hi Ashlee! I agree, the maple flavor goes excellently with the pork – and the apples too! what a big chunk of meat! but i have to try this next time, tired of the old fried chops! I recently made something similar to this. POrk chops with roasted apples and squash. Only my prok chop is the kind you hate. I bought the thin ones because apart from it being the cheapest cut, I haven't really found much success in cooking hefty pieces of pork. I would love to give this recipe a try soon. Your pork looks so lovely in its rich, earthy tones and mouth-watering, glazed goodness.